Rubber Hugs by Kristen: A Case of Bugs! 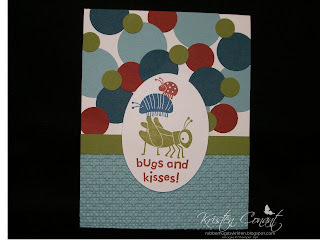 I bet that title got your attention!--LOL This adorable card of stampercamper's over on SCS was just too cute to pass up. I made some changes and came up with this one! Thank you to all of the fabulous stampers who love sharing their work with all of us. Tahnk you for stopping by! This is CUTE!!!!!!! I have never got round to gettting this set! Maybe I might have too!LOL!